Location is the most important aspect of a long term survival shelter. It will make or break your survival strategy. 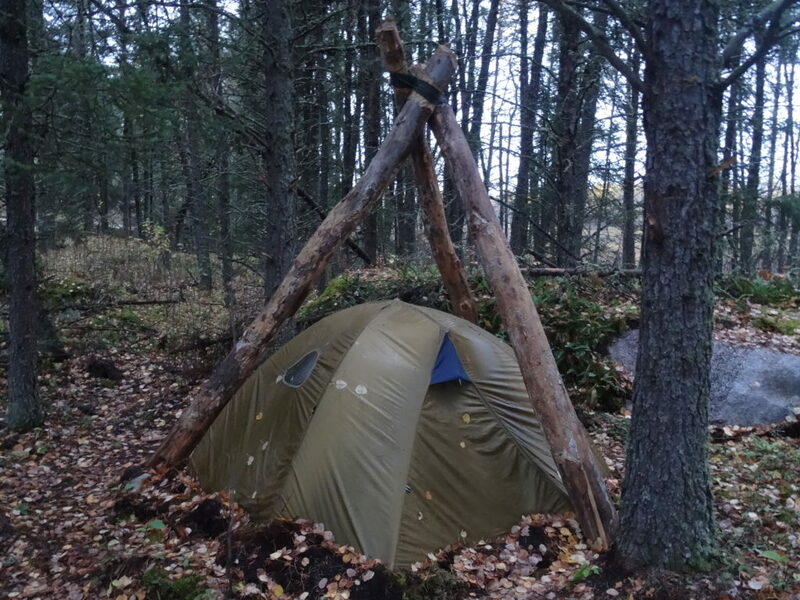 This article will help you choose the best location for a wilderness shelter if you were to use it for more than a month. Your camp should be no more than 60 yards from a water source. You will do the trip at least once a day, and you don’t want to waste energy. This is super important. There should be enough firewood to last for the amount of time you’ll be there. Try to calculate how much wood you’ll need, then triple that amount; that is how much available wood should be near your camp. Another huge point is abundance of materials for building your shelter. Will you use pine boughs, thin poles, clay, moss? You don’t want to be hauling those from a place far away, so choose carefully. If your type of shelter requires the use of a portable shovel for digging then make sure the ground is easy to excavate and there aren’t many rocks buried. The sun provides you light, heat, vitamin D and an awesome and necessary morale boost. So make sure you bring an induction compass or use natural methods to find out the four cardinal directions. During summer make sure your shelter shades you from the sun when it is at its peak (it will be S). Your shelter should face towards the sun for the first half of the day during the winter months (face SE). Make sure the trees or mountains around won’t block the morning sun. You need to determine the prevalent winds in your area. Do they come mainly from the West? And take in consideration the breeze created by mountains and valleys (see below). 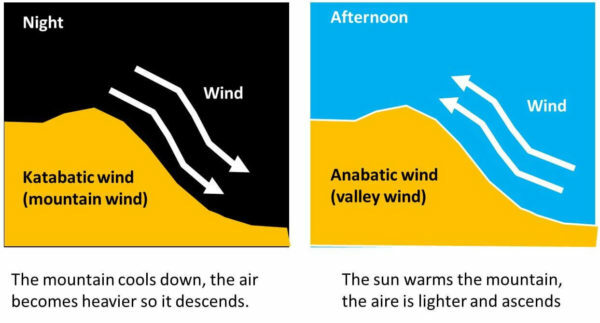 Its important to know where the wind will come from because it will blow rain and smoke into or away from your shelter. So plan accordingly. In addition it will also steal the warmth from your shelter so make sure you seal the sides where it might get in. Your location must not be in the path of potential natural hazards like floods, avalanches, mudslides etc. It should not be too exposed to the elements in case of strong winds. Another hazard to watch for is falling trees and branches (widow makers). For dead trees and branches that might fall an option is to cut them with a survival hatchet or saw. This is where my partner and I slept during our 6 months in the forest. We had a lean-to where we hung out during the day but retreated to our tent at night. We chose a spot close to a huge rock for protection and erected this tripod to protect our tent from widow makers. We had pretty insane thunder storms, and we just accepted that you can’t always be completely safe. If mosquitoes are abundant in your area you should choose your location very carefully. Don’t settle near stagnant water. Choose a breezy spot. Although this would be counterproductive during winter. So plan for that and make a compromise. Bugs do not like to be in exposed areas. If it is really insane there, and you have no mosquito net, consider setting up an overnight camp in a small and breezy island. Some indigenous peoples from North America would actually build platforms in the middle of lakes to sleep during the peak mosquito season, but they didn’t have the luxury of a lightweight tent. 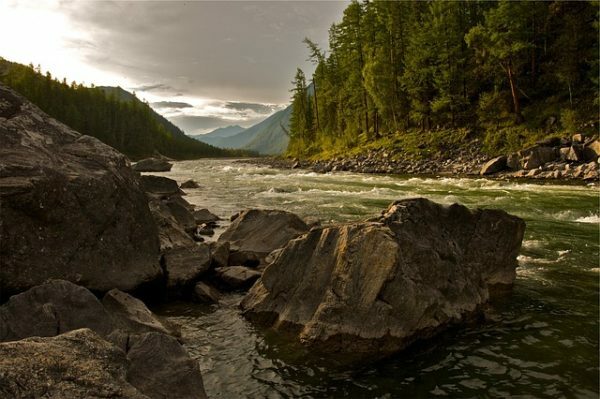 Your camp should be in an easily accessible area either by trails or river. When we stayed in the forest we chose an extremely secluded spot in an isolated lake. That turned out to be a huge mistake. The portage was at more than 1 mile long through submerged marsh, and the area wasn’t ideal so we ended up choosing another spot and portaging everything again. Lesson learned. You will probably have to do some travelling for foraging for example so make sure it won’t be very hard to get in and out of your area. 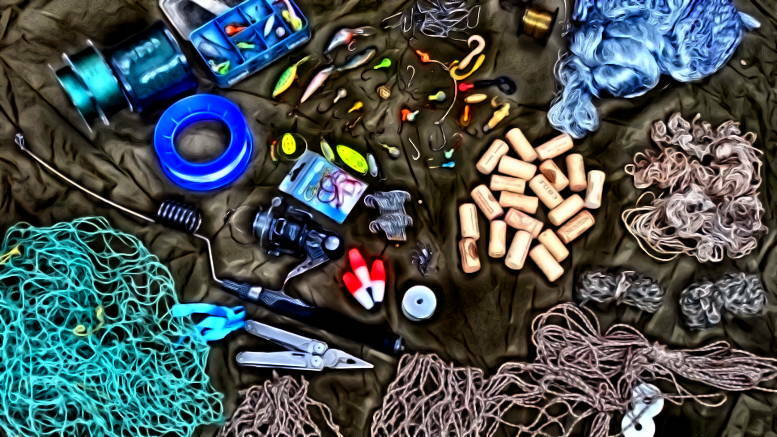 Fish would probably be one of your main staples so find a spot that is very close to a great fishing spot. Near some rapids or waterfall would be great. You really want to minimize the travel time to your foraging areas. The same guidelines apply for your trap line, ideally it should be a loop that is close to your camp. Make sure there is an area for when nature calls. It should be more than 100 yards away from your source of water and kitchen (flies). When we were in the forest we didn’t actually establish a specific spot for this but we didn’t go very often due to lack of fiber and food anyway. We delimited an area for this and marked really well each buried “mine”. 4 Comments on "This is Why Location is Key for your Long Term Wilderness Shelter"
Shelters Shacks and Shanties is a great book. If someone can’t build something after reading this…. something is wrong. How long did you stay before you noticed that obtaining firewood was becoming difficult? I’ve always thought that permanent residences became problematic after using all of the easy resources close by. Many of the Reality North Woods TV shows demonstrate that, with homesteaders having to drag in firewood from long distances away. When we chose our spot it was full of fallen trees. When we left it was clean of fallen trees, haha; but we never struggled to find wood. We also kept our fire smouldering (almost dead) when not needed and then brought back the coals back to life when needed. I also lived in a humble community in Nicaragua for 6 months cooking every meal over a wood stove just as everyone else in the community. The people there have used all the firewood nearby and have to walk more than 3 kms to get to firewood and carry it back over their heads. I like to minimize unnecessary work so I tried to make our stove more efficient and also made a solar oven in Nicaragua. In the forest I wanted to make an efficient stove out of mud, sand, and clay. In the end I thought it wasn’t worth the effort because we stayed just half a year. – Having an extremely efficient wood stove design for winter (either metal or made of mud and sand, rocket stove) and a separate efficient cooking stove. 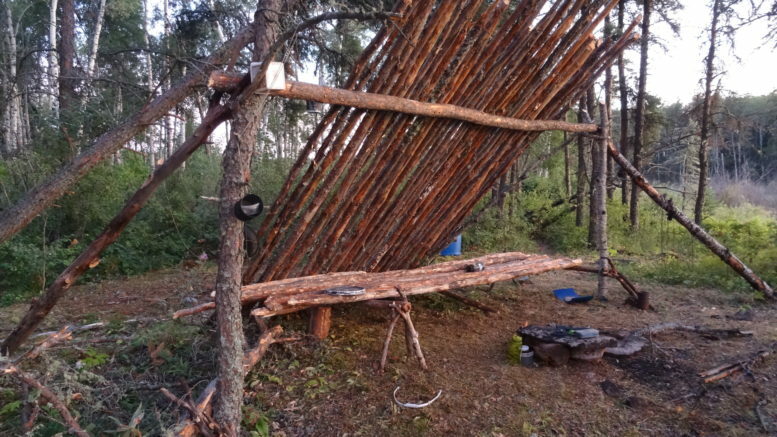 Try to carry a limb saw for building a shelter,and for fire wood. want to attract unwanted guests.